Andy Paterson, originally from Batlow, was a teacher at Bundawarrah School, five miles from Temora, from 1934-1939. Below are some reminiscences he penned in a letter to Les Gillard in 1986 upon Temora Rugby League Club preparing for a reunion. The letter is edited. With ‘Tiger’ Payne I refereed most of Temora’s 1st grade home games during that period and also did a number of the Eric Weissel Gold Cup games. I did not do any of the Maher Cup games as they were played on Wednesday afternoons and I was unable to secure leave to officiate at those times. Also Billy Lawrence from Barmedman was an excellent referee and was easily the outstanding ‘centre-man’ in Group 9, and deserved his appointment. I can mention some of the past members and officials of that time. First, there was Norman Bland, who was president for a number of years. He owned a timber yard and joiner’s shop with Oscar Haunstein. 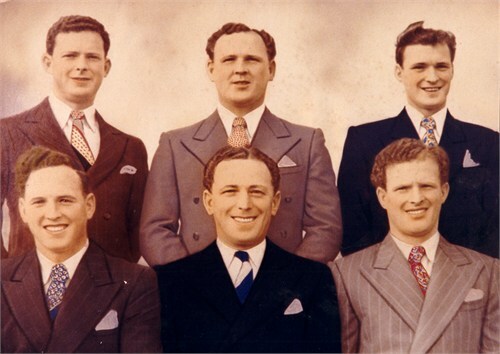 Front – Joe Constable, Harold ‘Mucca’ Thomas, Harry Owen, Jack Stephenson. Source: Temora Dragons Rugby League Club via Facebook. Jack Adamson was secretary during the period – he was connected with Adamson’s Stores, and Paddy Bray assumed the presidency when Norman Bland relinquished the role. Some of the outstanding players during this time were Frank Blundell and ‘Snowy’ Marsh. Frank Blundell owned a bakery near Mee Lings store and was the father of Heather McKay – the champion squash player. ‘Snowy’ Marsh left Temora and went to Ardlethan. The Lynch brothers ‘Snowy’, Cal and ‘Ginger’ were great players too. ‘Snowy’ at the age of 19 was the youngest player to be selected in a Group 9 team and was a great centre. Cal spent several years playing with Western Suburbs 1st grade, while ‘Ginger’ was a regular with the Temora team. At this time Temora was a very important railway town and a great number of men were employed in the loco workshops. 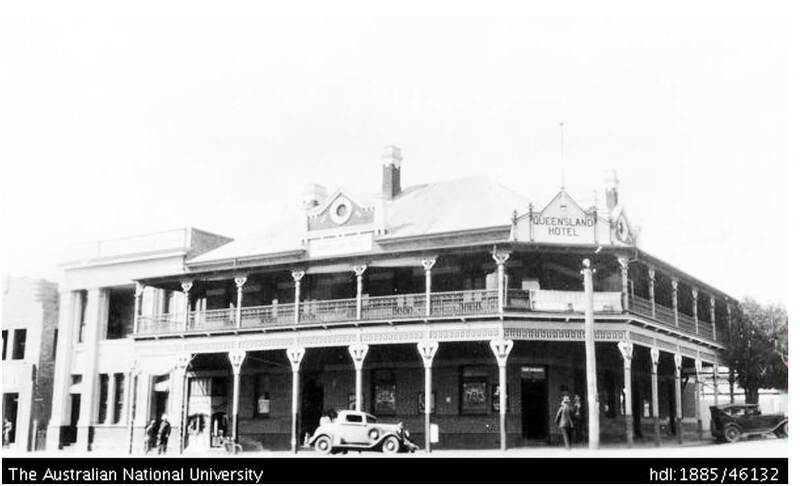 There were some very fine players who came from the railways – Lennie Reid, ‘Mucca’ Thomas, brothers Eric and Blue Curran, and Reg Maker – all of whom represented Temora in Maher games. I believe Reg Maker originally came from Newtown’s 1st grade side. Perhaps some older members will remember that great lock ‘Buck’ Bray, one of the most punishing locks that I have seen. And I must not forget to mention a ‘blow-in’ called Phil Bagwell. He was a very fine winger and had a beautiful fend as he skirted the side line (after being offered £1 by Perce Marshall if he scored a try). Then there were the local players who had great games and were equal in ability to any of the imported players. Some I those I recall are Eric Weissel, Bill Pinney, Jimmy Woods, Alan Maroney, Bill Byrnes. 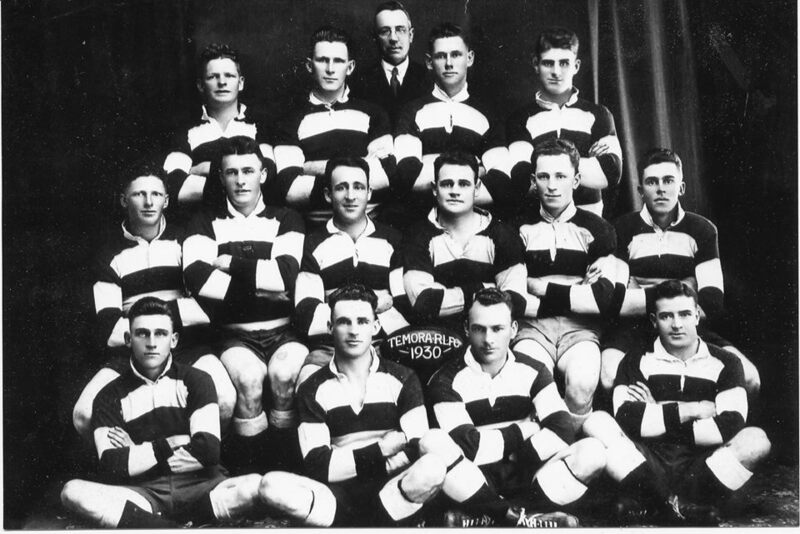 Perce Marshall was the mine host of the Royal Hotel, and a great benefactor to the club and players in these Depression years. Players were paid £1 a game. This was not too bad when you equate it to the basic wage of those days – £3 a week. I remember Perce going around all the players picked in a Maher Cup side who were out of work and going to play at Cootamundra – he gave each one £1 spending money so that they would not be embarrassed. Another stalwart and a keen supporter was Bob Aldridge, who in my days was the caretaker of the School of Arts near the Catholic Church. He was responsible for organising the junior or the school boys’ competition (I think a ‘colour’ competition) where many of the local 1st grades learnt their basic skills and he could easily have been known as the ‘Father of Rugby League’ in Temora. He was also a great confidant of Tom English, the first secretary of the Country Rugby League. Tom English married Billy Byrnes’ sister. One incident I recall. It was my initial appointment to referee a home game at the Recreation Ground at the beginning of the season. I was unfamiliar with the players, and as was my practice I liked to address the players in the dressing rooms, firstly to introduce myself and secondly to let them know what I would be expecting from them. On entering the Temora players rooms I was amazed to see an Australian Test jersey moving around among the players. I quickly assessed that the wearer couldn’t have possibly won a place in the touring Kangaroo Team. Apparently one of the players must have seen the look on my face. Quickly and quietly he explained that when Eric Weissel returned from the Kangaroo Tour he donated his jersey to be raffled and it had been won by the club’s handyman Herbie Dunn. 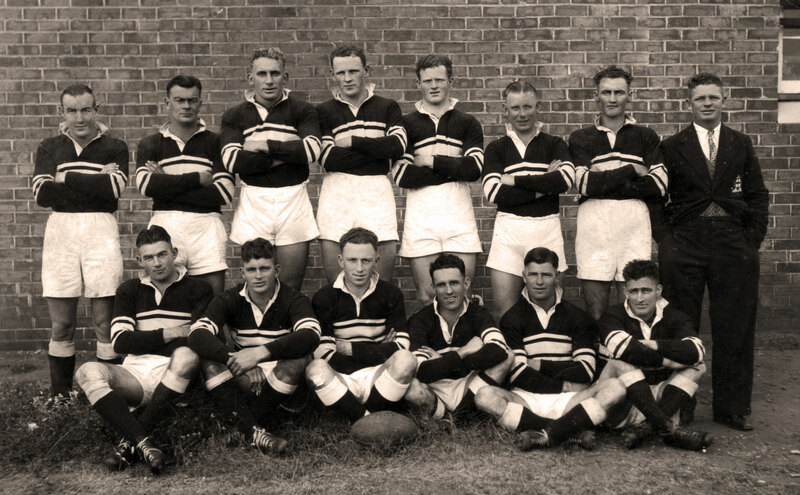 In those days of the middle 30s the Temora team played in an interlocking 6 inch or 8 inch red and white striped jersey. These were halycon days as the club held the Maher Cup on many different occasions, retained the Eric Weissel Gold Cup and journeyed to Canowindra, bringing back the Jack Hore Gold Cup (the pride of the Cowra Group). Quite an array of prestige cups to hold at the one time. I recall the Temora Maher Cup team returning home after defeating Cootamundra on a Wednesday afternoon. They arrived at the corner of the Queensland Hotel around 7pm to be welcomed by the strains of the Temora town band and a great crowd of local residents who cheered the players until they were almost hoarse. It was a real heroes welcome. After several speeches of congratulations the battered old cup was passed around among the people who showed their approval by placing a donation into the Cup until it was overflowing with £1 and 10/- notes for distribution among the players. It was indeed a very stirring homecoming. It was common practice for the supporters to hire a special train, and of course the engine and carriages were decorated in the streamers of the club’s colours. The arrival of the team was heralded by the screeching of the train’s whistle. It was certainly a very emotional and blood tingling occasion and something I am pleased to have experienced. This entry was posted in Places and tagged Andy Paterson, Eric Weissel, Lynch Brothers, Temora. Bookmark the permalink.